TS EAMCET 2018: The Telangana EAMCET (engineering, agriculture, medical common entrance test) registration has started from this week. The notification and other details are available at the Telangana State Council of Higher Education (TSCHE) website : tsche.ac.in. The exam will be held from May 2 to 7, 2018 in both morning and evening shifts. All the aspirants who clear the entrance examination will be eligible for admission in BE, BTech, BSc courses in agriculture and technology at various recognised institutions in the state. Telangana EAMCET is a state level common entrance test (CET), conducted for selecting candidates for admissions to undergraduate Engineering, Agriculture and Medical courses in the govt and private colleges located across Andhra Pradesh and Telangana. The Telangana State Engineering Agricultural and Medical Common Entrance Test (TS EAMCET) 2019 will be conducted from May 3. While the exam for the engineering stream candidates will be held between May 3 and May 6, for agriculture and pharmacy (AM) stream exam will be held on May 8 and May 9. Commencement for submission of online application forms will begin from March 6 and last date for submission of online applications without late fee is April 5. “Candidates will be given an option to correct online application data submitted by them between April 6 and April 9,” Convenor, EAMCET 2019. The candidates, however, will have a chance to apply for the exam by paying late of up to Rs 10, 000 until April 28. Hall tickets can be downloaded from the official website between April 20 and May 1. The computer based test will be conducted in total 54 centers across 18 test zones. The registration fee for the engineering or AM stream is Rs 400 for SC/ST candidates and for others it is Rs 800. For candidates wishing to appear for both Engineering and AM stream, fee will be Rs 1600(for other category). For general category, it is Rs 400, for SC/ST category candidates and Rs 800 for all other candidates. In case, a candidate wants to apply for both the groups, they will have to pay Rs. 800 for SC/ST categories and Rs 1600 for all other categories. The morning schedule begins from 10 am to 1 pm and the afternoon exams are scheduled from 3 pm to 6 pm. 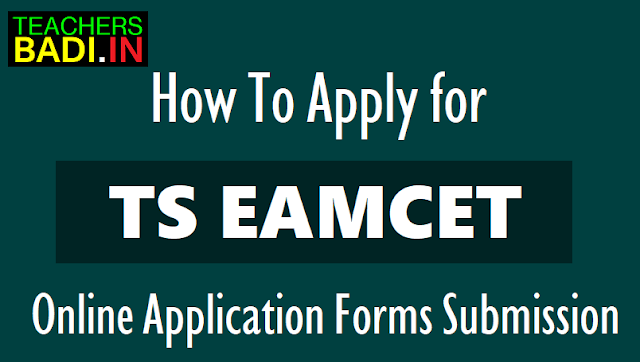 TS EAMCET 2019 online application submission started, register at eamcet.tsche.ac.in: Telangana Engineering, Agricultural and Medical Common Entrance Test (TS EAMCET) 2019 online application process will begin today. The TS EAMCET examination is conducted by the Jawaharlal Nehru Technological University (JNTU) on behalf of Telangana State Council of Higher Education (TSCHE). As per the TS EAMCET 2019 notification released by JNTU Hyderabad, the Telangana EAMCET exams will be conducted from May 3 to 9. The examination for candidates seeking admission to Engineering courses will appear for TS EAMCET 2019 between May 3 to May 6, the TS EAMCET 2019 for Agriculture and Pharmacy programs will be conducted on May 8 and May 9. The total duration of the exam is three hours i.e, from 10:00 am to 01:00 pm. The online application process for TS EAMCET 2019 will start today and the last date to apply for the same is April 5, 2019. Correction of online application data: April ..
2. Make online fee payment by clicking on the link which reads Pay registration fee on the homepage. Candidates can also submit the online application for TS EAMCET 2019 after April 5, 2019, with additional fee. Corrections: Candidates can correct already submitted online application data between April 6, 2019 and April 9, 2019. Hall tickets: Hall tickets will be available on the official website for candidates to download between April 20, 2019 and May 1, 2019. Candidates are reminded that only online applications forms would be accepted. Also candidates are not required to send the print out of the filled forms. The online applications can be filled till April 28 with late fees. Step 2: Click on application fee payment through this option.